Gems and Gemstones in the game are used to enhance equipments for more stat bonuses. What is best is that, you can select stats you like to add rather than generating random ones. Choose wisely and equip Gems that will make your character stronger! - Gems are used to add additional stats into a gear's Gem Slots. - To add a Gem, click any gear you have then click "Customize" > Gems Tab. - Higher Lvl and Grade will generate higher stat bonuses. - Via the [Craft Menu] > [Evolve Gems], or go to your Inventory > [Misc] > [Gems]. 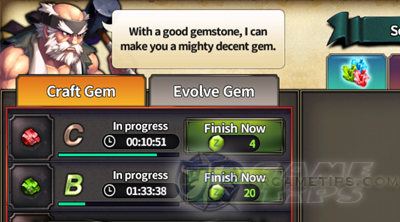 - To evolve a Gem, you need to consume a number of Gems to reach your desired percentage chance. For all Grades, better aim for 85% or 100% chance, to make sure not to waste Gems from Fails. - IF FAIL = All gems used to increase the success chance will disappear, the base Gem will remain. Can I Remove/Reset the Stats of Gems? - You can't, and it is not possible to re-roll the stats of Gems from the [Customize] > [Reset] feature, but it can be replaced with a better one, destroying the previous Gem. How To Get More Gems and Gemstones? - Once you have enough Gold, buy all Gems from the Shop, use all available chance per day. - Trick: You can also transfer Gemstones to your other characters using the Storage. Yup, your other characters can also craft Gemstones for your Main Character!